White powder covered the scene of a crash at a Quincy gas station. A white substance coated a gas station Tuesday afternoon in Quincy, Massachusetts, after the fire suppression system at the business went off. 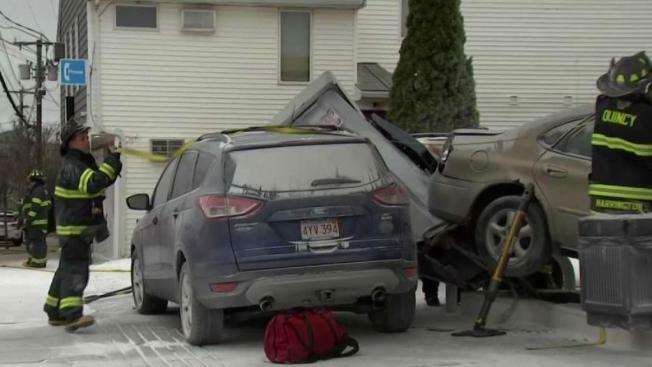 The situation began when an elderly driver backed his car into a gas pump and that pump partially toppled over onto another car. Police officers and firefighters arrived at the scene, and as they were trying to free a couple of drivers who were trapped, someone inside the gas station tripped the fire suppression system even though there was no fire. "I guess in the commotion, people do things and they start hitting buttons and pulling triggers," said Deputy Quincy Fire Chief Tim Burchill. The scene unfolded at the Prestige gas station at Franklin Street and School Street. Six people were taken to the hospital: two firefighters, a police officer and three civilians, including the driver who hit the gas pump while in reverse. All had just minor injuries from breathing in the chemicals. The white powdery substance that was sprayed all over the place can be an irritant.